These fun witches brew cupcakes are the perfect sweet treat to celebrate Halloween with! I have always loved Halloween. LOVED. It’s my favorite holiday in fact. I love dressing up, all the spooky characters and the yummy, festive themed food. The way some people anticipate their birthday or Christmas is how I look forward to Halloween celebrations. I usually have my costume arranged by mid-summer. I can’t wait for the big day! I’ve actually had Sam and my costumes picked for months and I’m so excited I can hardly stand the waiting. In the meantime, we’ve done lots of decorating and now the next phase of Halloween celebrations has begun: the baking. You all know that I love time in the kitchen — especially with Sam. Ever since he was little, we’ve spent countless hours together making treats. It’s one of my favorite ways for us to spend time together. 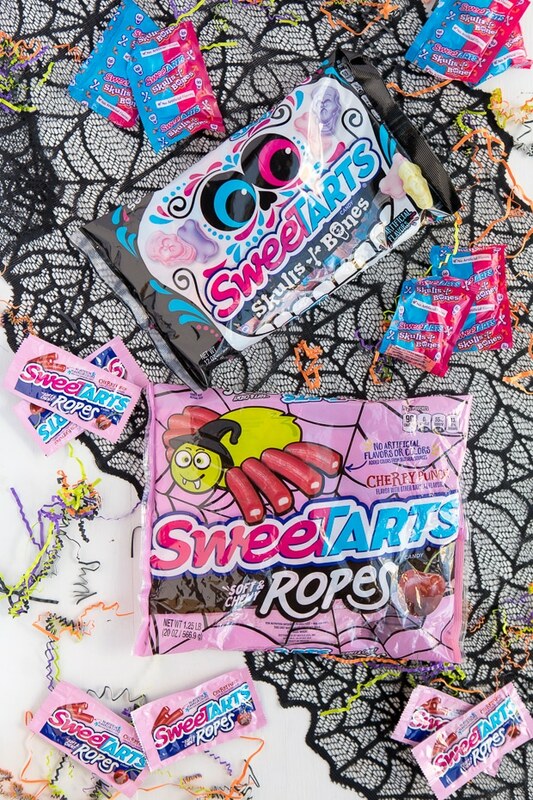 While shopping last weekend, I spied SweeTARTS Ropes and SweeTARTS Skulls and Bones candy. I knew we had to incorporate them into some treats! 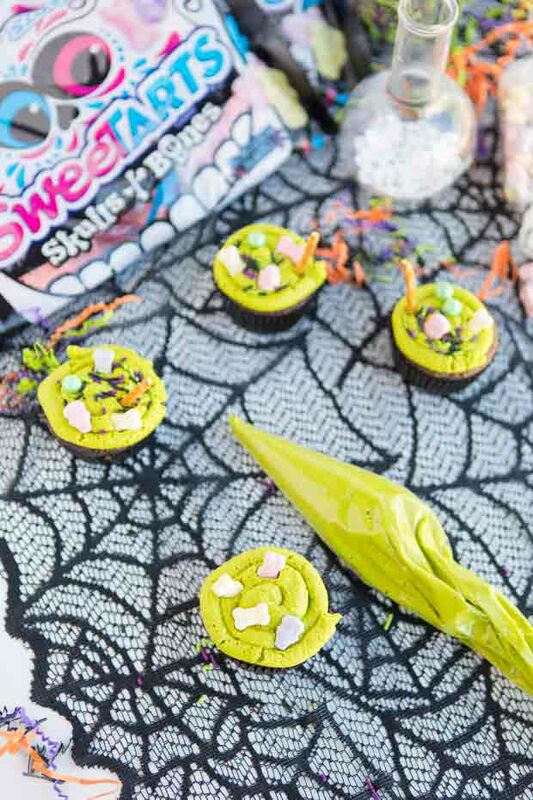 The result are these fun witches brew cupcakes — the perfect fun dessert for Halloween! SweeTARTS Ropes have always been a favorite for me. They’re a delicious soft and chewy licorice with a cherry-punch filling — a great balance of sweet and tart. As a mom, I like that they don’t have any artificial colors or flavors. All the coloring comes from natural sources. 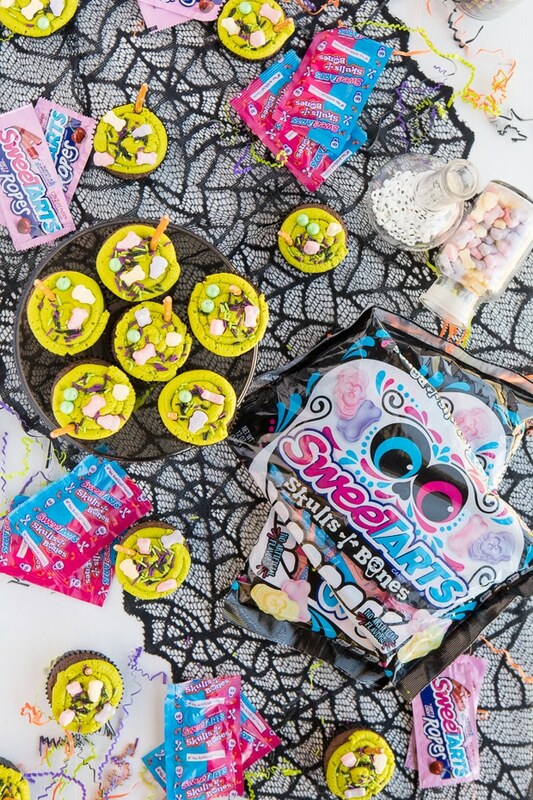 The SweeTARTS Skulls and Bones are a fun shaped, tangy candy with no artificial flavors. Kids — and adults — will love this sweet and sour and candy. 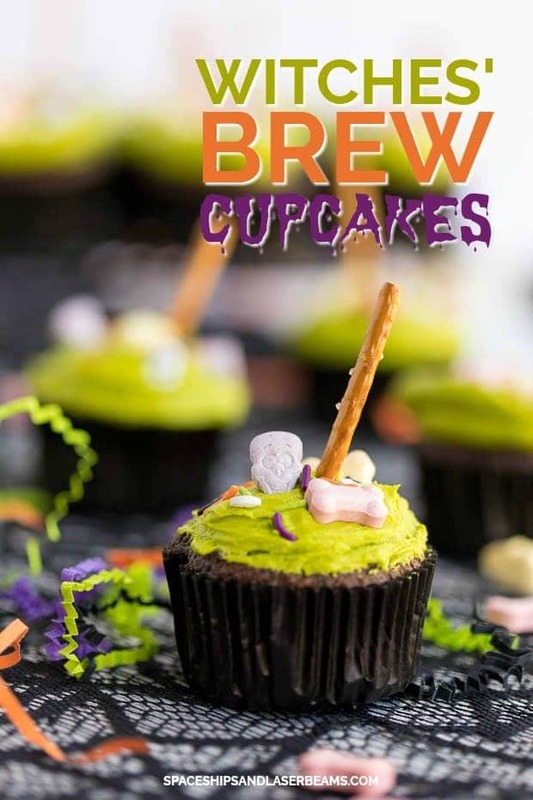 These witches brew cupcakes would be a great treat for a Halloween party or to take to your child’s classroom celebration. Sam thought they were so clever and loved helping me prepare them. I used my favorite dark chocolate cupcake recipe to make these. If you’re short on time, you could easily grab cupcakes from the bakery to make these even simpler! Bake for 18-22 minutes for regular cupcakes or until toothpick comes clean. Now — for the fun part — the toppings! You can make this easy, homemade buttercream frosting or grab your favorite at the store. You’ll also want green food coloring and a piping bag. In a stand mixer, cream butter with a paddle attachment. Scrape down sides and add confectioners sugar a cup at a time, mixing between cups and scraping down. Once all of the sugar is added, beat on medium-high speed for 2-3 minutes. Add vanilla extract beat on low until fully incorporated. Keep mixer going on low speed while slowly adding in the heavy cream and food coloring to your desired shade. Once heavy cream and color is fully incorporated, turn off and scrape down the sides of the bowl. Once the frosting is on, it’s time for decorating. I used SweeTARTS Skulls and Bones, Halloween sprinkles and pretzel sticks. Just add SweeTARTS Skulls and Bones. 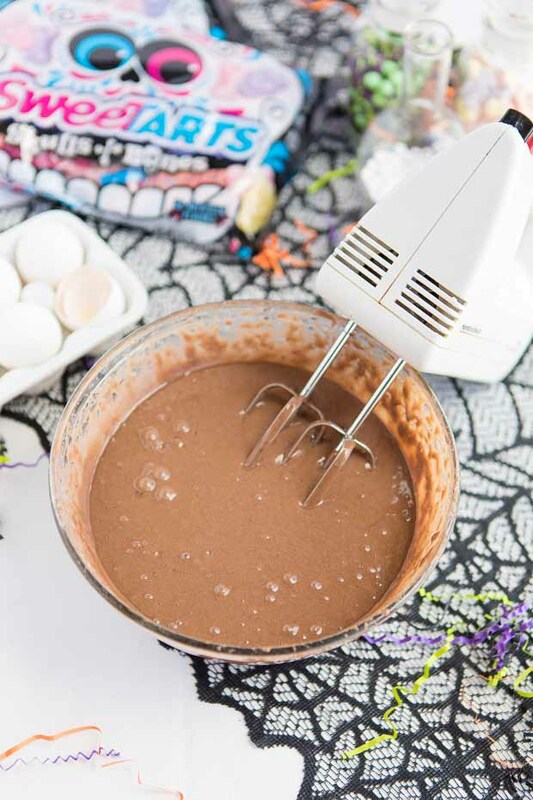 Then add halloween sprinkles for a little extra festivity. Finally, insert a pretzel stick so serve as a wooden spoon and enjoy! 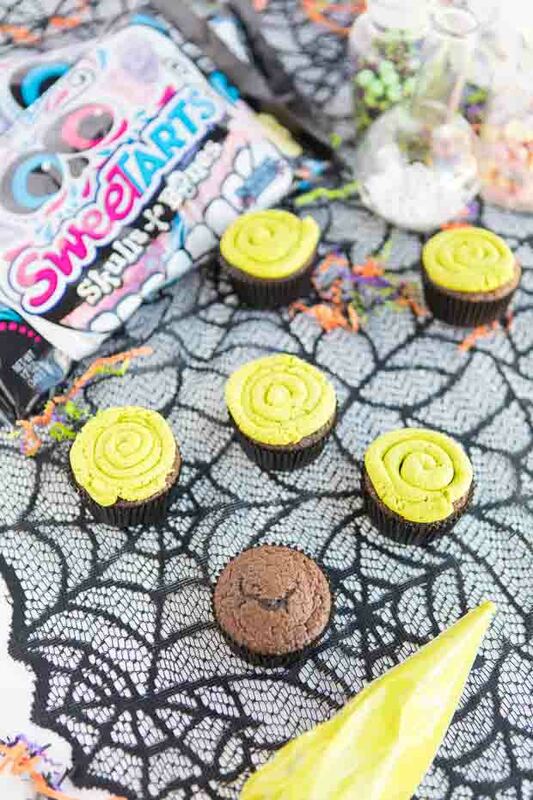 We had a blast making these Halloween cupcakes — and eating them. I know your crew will love them just as much!